SUMMARY: The vertebral artery normally arises from the subclavian artery, and variations in its origin have been described. We describe a unique case of the left vertebral artery arising from the thyrocervical trunk. Anomalies of the extracranial branches of the vertebral artery are rare.1 Patients with cervical vertebral anomalies may present with symptoms of vertebral basilar insufficiency2 or may be asymptomatic. This report describes a case of anomalous origin of the left vertebral artery from the thyrocervical trunk discovered on CT angiography in a patient with a family member with known aberrant vertebral artery origins. To the best of our knowledge, this vascular variant has not been previously described in the English-language literature. Imaging was performed on a 64-section SOMATOM Sensation scanner (Siemens, Malvern, Pa). Omnipaque 370 (GE Healthcare, Piscataway, NJ) contrast was injected through a 20-gauge intravenous needle in the patient’s right antecubital fossa at a rate of 4 mL/s for a total of 80 mL. By use of bolus-tracking software, scanning was performed 5 seconds after contrast was identified in the internal carotid arteries in the neck. Helical acquisition was performed by using the 64 × 0.6 mm scanner configuration, and images were reconstructed at 1.0 mm with an overlap of 0.6 mm. Multiplanar reformations, thin-section maximum intensity projections, and volume-rendered images were performed. 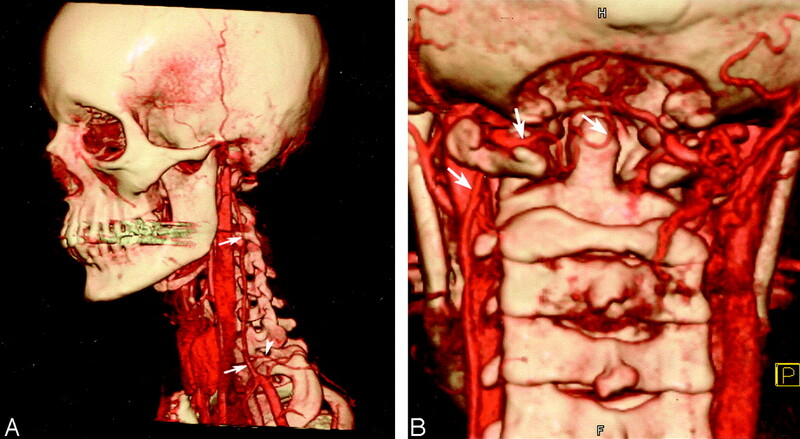 The left vertebral artery was identified arising from the thyrocervical trunk (Fig 1) and was seen at the C1–C2 level extending along the lateral aspect of C1 in a normal location and entering the dura in the foramen magnum. There was no evidence of collateral vessel formation to suggest occlusion of the vertebral artery and subsequent filling by peripheral vessels. A continuation of the left vertebral artery from the posterior inferior cerebellar artery to the basilar artery was not visualized. The vertebral foramen on the left were hypoplastic compared with those on the right (Fig 2). The right vertebral artery originated from the subclavian artery in the normal fashion. A, Oblique, volume-rendered CT angiogram projection. Note the left vertebral artery arising directly from the thyrocervical trunk and extending cephalad outside of the transverse foramina of the vertebral bodies (arrows). The suprascapular artery is noted arising directly from this vessel in the lower neck (arrowhead). B, Posterior, volume-rendered CT angiogram projection. There has been a decompressive occipital craniectomy, and resection of the posterior arch of C1. The left vertebral artery is well seen continuing intracranially (arrows). A, Axial image of the cervical spine at C4 in bone algorithm. 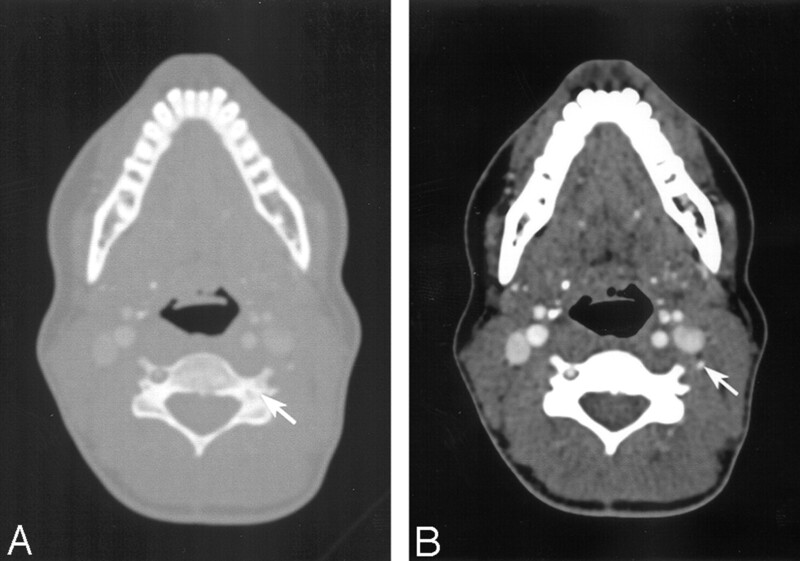 Note the absence of the foramen transversarium on the left (arrow). B, Axial image of the cervical spine at C4 in soft tissue algorithm showing the course of the left vertebral artery (arrow). During embryologic development, 8 cervical segmental arteries develop and originate from the aorta. The first of these cervical segmental arteries is also known as the proatlantal intersegmental artery.4–6 A persistent proatlantal artery can be seen with aplasia of the ipsilateral and hypoplasia or aplasia of the contralateral vertebral artery.6 Taking this further, a persistent proatlantal artery that connects the internal carotid to the vertebral artery can be considered as an anomalous origin of the vertebral artery.6 Our patient’s father, who had type II proatlantal intersegmental arteries, also had bilateral absence of the vertebral arteries. It is important for the neurovascular interventionalist and the neurosurgeon to be aware of this variant. Vertebral artery injury is a known complication of extended lateral decompression during anterior cervical spine surgery that can result in exsanguinations and permanent neurologic deficits.21 During surgery at the cranial vertebral junction, injury of the vertebral artery can cause brain stem ischemia and cerebellar infarction.5 Anomalous vertebral artery origins present a pitfall at diagnostic cerebral angiography because they may be assumed to be occluded or diseased if they cannot be catheterized.17 To prevent complications, it is essential to assess the vasculature in this region before conducting medical procedures.22 Furthermore, this observation and the finding of vertebral anomalies in the patient’s father lead us to hypothesize that vascular variations may be hereditary. Accepted after revision July 10, 2005.